Lemont St. Vincent de Paul Seminary "Vikings"
Lemont (population 13,100) is located in far northeastern Illinois in the southwest corner of Cook County. The city is located on Lemont Road between Interstate Highway 55 and Illinois Route 171. The Des Plaines River and the Sanitary Drainage and Ship Canal both flow to the northwest of town. The Amtrak/ Atchison, Topeka, & Sante Fe Railroad has tracks that travel through Lemont as well. Lemont is located about 25 miles southwest of downtown Chicago. Early industrial strengths of Lemont included the development of rock quarries. This brought in several immigrant workers to help populate the area and work the quarries. Lemont's growth was steady, though not remarkable for its first 100 years. The town's population in 1960 was 3,400 and this grew to 7,350 by 1990. However in 2000, that number had nearly doubled to 13,100. 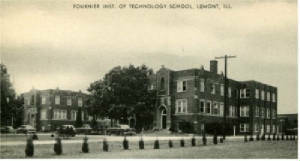 Fresh off the heels of the final graduating class from the Fournier Institute of Technology's college department, St. Vincent de Paul Seminary was opened in the fall of 1955 on the site of the former school which had been opened as early as 1930 by engineer Arthur J. Schmitt, founder of the Amphenol Corporation, as educational grounds for future engineering students. The Congregation of the Mission, which was founded by St. Vincent de Paul himself in 1625 in Paris, was interested in expanding its locations and found that the Fournier property was for sale sometime prior to the winter of 1954-55. They reached an agreement with Schmidt's foundation to purchase the school in February 1955 and began moving into the facility in July in time for the fall school opening. Over time, the entire campus was put to good use by the Vincentian Fathers, not only for the use of educating teenage boys who were considering a vocation in religious life, but also for housing the Josephine Sisters on campus, and in 1964, opening the DeAndreis Seminary for those past high-school age to prepare for the priesthood. That seminary stayed open until the mid-1980's when it closed and sold its property to the Lithuanian Organization (aka the Lithos Foundation). The new group did open apartments for retirees while the high school continued in operation around 1987, but the Vincentians decided in 1992 to close the school for good due to declining enrollment. 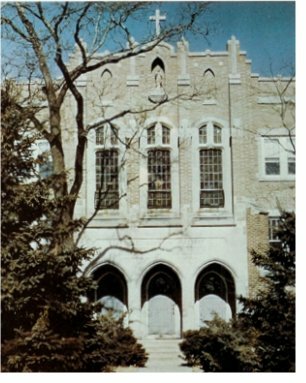 The property was bought by a real estate developer who planned to create a subdivision on the property on Archer Avenue in Lemont, but after attempts to sell the main building on campus, it was demolished in 1996. School song: "Hail Our Colors"
We hail St Vincent dePaul! Despite the low enrollments, the school did offer a basketball team that played in the IHSA state tournament during the late 1970's and early 1980's, according to this author. "We just didn't have great basketball teams and seasons, we also had great soccer teams and seasons. Those were the two sports we played as a high school all over the Chicagoland area." A friend of the Glory Days website, Bernie Hannigan, provided the photo to your right and the school building photo at the top of this page via his copy of the 1968 St. Vincent de Paul Yearbook, The Medallion". The article states that St. Vincent de Paul had succeeded in finishing their fourth straight winning season that year. If you have any frther information on the St. Vincent de Paul basketball program, please contact us. "We had wrestling and soccer. The school was small so I lettered 4 times in both of these sports. Even though we were small and a very religious school – we had some great standouts in all three of these sports. "My freshman year (75) Doug Bruno was our Athletic Director. I think he was there for all of 3 days and then went off to coach under Ray Meyer at DePaul." "My name is Phil Cahill and I am a 1976 graduate of St. Vincent de Paul. I played basketball for Doug Bruno (head women's basketball coach at DePaul University and coach for the USA women's basketball team at the world games) and he is still a close friend of mine. Doug coached the entire 1975 season at St. Vincent. "The school, at the time I was there, competed in soccer, wrestling, tennis, and basketball. All students lived on campus and were permitted to go home on the occasional weekend. When on campus each student had a "job" to attend to daily. The weekends spent on campus found the students performing "work orders" on Saturday mornings. Work orders included assignments like washing and waxing dormitory floors, cleaning the shower areas, dry mopping and wet mopping the gymnasium. "The gymnasium was built in an old aircraft hanger that was leftover from the Fournier Institute. The playing surface was actually raised up slightly off of the concrete floor that existed below. At each end of the gym were huge garage doors. "Study hall was mandatory each night after dinner, with night and morning prayers. Intramural sports were popular and the "Class Series" (seniors vs. juniors, and sophs. versus frosh, and so on) were always interesting. 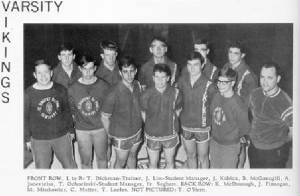 In basketball during the mid-70's, St. Vincent's competed against St. Joseph Seminary, St. Charles Boromeo, Elgin Academy among others, and faired relatively well. "As I come across other information I will pass it along. Great site. I am always looking for information about St. Vincent and was surprised I found it at your site." "I attended St. Vincent's in the 60's and would have been in the class of 1968. After punching in the subject, up comes the picture of the main building at the seminary. When I scrolled further, I was more than amazed to see the photo of the basketball team. I enlarged the picture as best I could (I am not really a big computer user, and almost never use the internet), and was immediately flooded with memories of my time at St. Vincent's. I certainly recognized most of the guys in the picture, and even though I could not really read their names, I pretty much knew who was who. These guys were all in my class! "Of course I remembered Fr. Seghers. His nickname, almost all priests and most of the kids were given nicknames, was Jet, or sometimes Jimmy Jet. His first name was James and the nickname, if I remember correctly, came from the way he signed his initials that he put on the frequent notices he attached on the dormitory bulletin board. "Another priest who often left us notes was Fr. O'Brien. His nickname was R-job. This too from his initials; R.J. O'b.. Richard J. O'Brien. My own nickname was Big John. Here I am almost 60 years old, I couldn't tell you what I had for breakfast today, but I know the nicknames of some people from over 40 years ago. "My two years at St. Vincent's were just the best times any kid could have ever had. It was like having a couple of hundred brothers. I vividly remember all of the buildings and the great priests and fellow seminarians. The only reason I left was because I knew I really wasn't going to be a priest and I figured I was missing something better by not going to a regular high school (GIRLS!!) Now I am a grandfather and realize that I could have at least stayed on the full four years, had a great time, and not missed out on anything. "In the internet posting you asked for info on the seminary. I don't think there was any team names or anything. When I was there, I don't even think we played too many other schools in any sports. We did have a great basketball team that would play some other seminaries and I remember once we hosted a baseball game against, I think, Brother Rice High School. "What I do know is that the schools' colors were blue and white. We had a school song that mentioned those colors but I don't remember all the words. The school's motto was "Prompt, Exact, and Cheerful." All of the students from Sophomore year on up wore a patch on the front of our blazer, (received after enduring something called "patch day," the details of which I still feel duty bound to keep secret) that had the motto spread out in a circle over the school emblem. This was in Latin, "Celeritas, Diligentia, Hilaritas." My Latin is rusty, but I think that is correct. "The song had part that said "...glory to the blue, honor to the white...prompt, exact and cheerful, we hail St. Vincent de Paul." "Anyway, I don't know who this note will reach. I hope it reaches someone. The internet article credited the photo as coming from a Bernie Hannigan who had the picture in his yearbook (what I wouldn't give to see that yearbook!). I didn't know a Bernie Hannigan but we (class of '68) had a Bernie O"Malley. Bernard J. O"Malley, I still remember the laundry tags sown on all your underwear. I this is going to him, Hi Bernie. As I remember, we just called you "O"Malley." "As I said, I'm not much of an internet user but I will absolutely keep checking my e-mails to see if I have gotten any reply to this. And if anyone out there remembers me from St. Vincent's, I would love to hear from you. You were all a great part of my life and I wish you all the best." "I just came across the page for school on your website. Very interesting history. Thank you so much for collecting it all. I attended St. Vincent dePaul Seminary from August of 1989 through May of 1991, when the school closed. I happen to have yearbooks for the school from 1986-1992. Since I was there when the school closed, I did happen to walk away with one or two knick-knacks - one of which is the front elevation blueprint for the administration building (the "A" Building, as we called it). It was a beautiful little building.